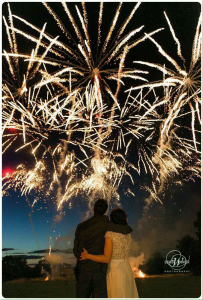 Our wedding fireworks displays give the perfect end to your perfect day and will amaze your guests. Our firework display organisers take care of everything leaving you to enjoy your special day. Nothing is too big or idea to wild in order to make your day perfect. Whether you wish to gather all your guests together to watch the display or have it along side you and your partners first dance. We pride ourselves on ensuring only the finest quality products are used in our displays, making a truly magnificent spectacle for you and your guests to enjoy. We love to choreograph the display to music making it truly unique to that one moment on your wedding day. The music is your choice ! Our designer will take your requirements and make a truly magnificent display. Please watch the video below of a recent wedding display we fired. We have many videos of our work and have uploaded a few to view. To see more, please just drop us a line and we will show you the quality that you can expect from us.